A frittata is a cross between a quiche and an omelet – all of the ingredients are cooked together. What I like about frittatas is you can use whatever you have in the larder – vegetables, herbs, meats. 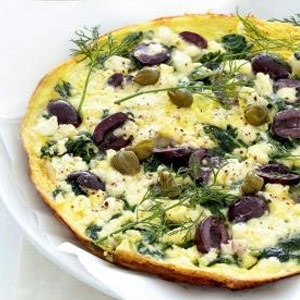 This version takes inspiration from Greek cuisine with ingredients such as feta cheese, spinach, olives and fresh dill. Boil a little salted water in a large pot. Add the cut spinach and steam for a few minutes until the spinach is wilted and just cooked. Drain and squeeze out all the excess water. Heat the butter and sauté the onion until soft. Increase the heat and add the spinach. Whisk the eggs and milk together and season with salt and pepper. Pour the egg mixture over the onion mixture. Stir a few times then reduce the heat. Sprinkle over the cheese and olives, cover and cook gently until the egg is set. Remove from the pan and sprinkle with fresh dill and capers. Next What Happens When you ask Siri Zero Divided by Zero?